The Three Rs: Rants, Raves and (Occasional) Reflections: "What's the Worst that Could Happen?" A friend is moving this week. She says she has everything under control, with four days to do it and not much to be moved. I envy that. 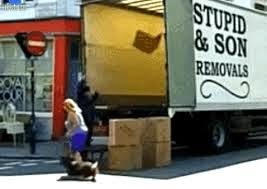 Over the years, I've moved many times--many times more than I would have liked. Collin and I have become experts at packing and organizing storage lockers. We've learned, out of necessity, how to deal with just about every imaginable moving day disaster. When Dad was alive, there was no problem. Dad either did the move himself or supervised the movers, and there were never any problems, beyond his complaints about my books. He once said he'd rather move furniture and appliances any day over the dozens of boxes of books. Now, almost all of my books are on my Kindle, along with all of my music, videos, photos, writing files and other documents. I'd love to be able to ask him to move my stuff now...and just hand him my Kindle! 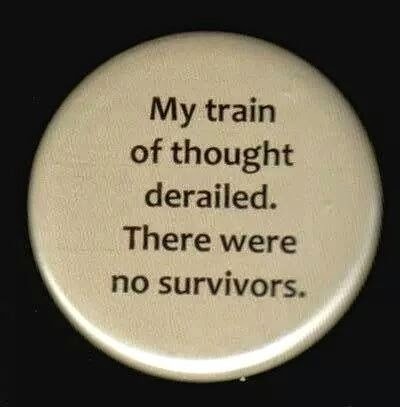 Almost every move since Dad's passing has been an unqualified disaster. The first time, we hired competent movers, but getting our critters to the new house was a bit of a problem. By that time, my pig, Iggy, was too big for the back seat of the car and she had arthritis. We rented a small trailer, but she wouldn't stay in it without me, so I had to lie in the trailer with her--and Collin's dog, Sandy, stood on my back all the way! Getting Iggy in the trailer, it turned out, was much easier than getting her out. The next time we moved, we borrowed a truck from a friend and hired the young man who did our lawn work. He'd always been trustworthy and a hard worker, so we didn't anticipate problems. He brought another guy along for the heavy lifting. It looked like this would be a smooth move. Then his girlfriend arrived with their baby. She was constantly in the way, right from the start. After taking Collin and me, along with the critters, to our next location, they took the truck--without asking--and went off to take care of their own affairs. When they finally did bring a load of furniture to the house where Collin and I were waiting, the girlfriend plopped the baby down on the living room carpet, turned our TV on, and made herself at home--after demanding I make them something to eat. I turned the TV off and refused her demands for food. We'd learned our lesson. 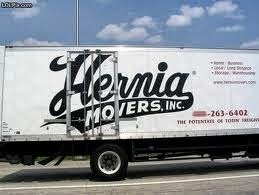 Next time, we hired professional movers--but I use the word "professional" loosely. It took them all day to load the truck (they spent most of the time using our phone to make personal calls and eating our candy, which had not been offered to them). They didn't arrive at our destination until almost midnight--after stopping for a long, leisurely dinner. At least they didn't steal anything, other than about half what they were paid. They could have finished moving us by noon, had they not done all they could to bill as many hours as possible. We've been in our present home just over eight years now. The move here was an easy one, with a new moving company provided by our good friend Carolyn, and another friend, Carol, with her large truck and trailer. God willing, we won't be moving again for a very long time to come, if ever. You make a good case for staying put. And for having as few possessions as possible. I'm shooting for being able to carry everything in a backpack. Except clothes, furniture (also keeping that to a minimum!) and my stuffed animals. Hmmm. My comment got lost again. I don't know what's happening here. Our last move was the easiest, moving from a condo into our house. 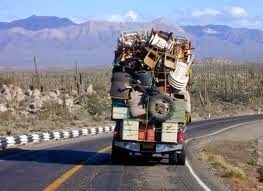 We hired local movers who gave me an estimate over the phone. They ended up charging at the higher end of the quote but they earned it. Especially after moving two heavy sofabeds from the second story condo we were in! The movers we had for our last move were wonderful. I'd recommend them to anyone. I think they were grateful, though, that we were on the ground floor! My husband and I will be moving soon.... I suddenly have the urge to crawl back into bed and roll into a fetal ball. Those are definite disasters, to say the least! Pretty annoying about Little Miss Entitled. 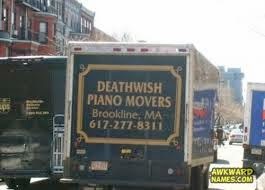 Hmm...consider this: Moving, the Movie. Directed by Michael Bay. Starring Shia LeDoofus and Megan Fox. With bigger and better explosions! Blimey with those experiences I'd be surprised if you ever moved again Norma :) that puts a whole new meaning on the theory that moving house is right up there on the max stress list! I'm hoping to NEVER move again, Grace! Your moves must have been even worst that you wrote... because I know what your neighbors are like. So to stay there hoping to never move again is something ! Gayle, I didn't even write about the guy Collin knew who was hauling some stuff to storage for us and without telling us he had another appointment, just drove off with our stuff. We didn't know until the next day that the loaded truck was locked up in his garage! Good gosh, woman. That's a lot to go through, and more than once. Sending you a box of Cherry Hand-Pies. I wish! They look soooooo good! If they would stay fresh, I send them to you in a heartbeat. Any flavour you fancied.